The Washington State Horsemen Bylaws are the rules and guidelines by which the organization operates. Bylaws are reviewed and revised annually during the WSH Convention. Washington State Horsemen has a Legislative Chairman/Lobbyist to track legislation that is introduced each year in Olympia. Legislation has and will continue to have an enormous impact on horse owners. Environmental issues affect horse people in ways that might not be realized until it is too late. Every year, land issues are brought before our legislature that could affect the use of lands, public as well as private, that we all ride on. 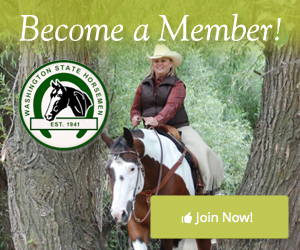 It is nice to know as members of this well established, fine organization, that WSH has someone in Olympia protecting our right to own and use horses in this state. “Protect the Rights and Interests of all equine/horse owners and the industry. Washington State Horsemen is proud of our judges and stewards! All have gone through a rigorous process of becoming certified and are available to judge your upcoming shows. Click below to visit the Licensed Officials Committee Page.